Apple has been awarded a patent for technology that would prevent you from snapping pictures and shooting videos with your iPhone or iPad at places or events, like concerts or museums, where it might be prohibited or inappropriate. The patent, granted on Tuesday by the United States Patents and Trademark Office, is highly technical. Apple’s latest patent describes an iPhone or iPad camera receiving coded infrared signals beamed from emitters in public places would temporarily disable device camera functionality, preventing any photography or recording for as long as the signal is on. "An infrared emitter can be located in areas where picture or video capture is prohibited," reads the patent. "An electronic device can then receive the infrared signals, decode the data and temporarily disable the device’s recording function based on the command." The technology patented by Apple could also be used to beam information about an object or a place to a lot of people iPhones at the same time when they are in the same location — like providing tour guide for a museum exhibit, or offering coupons in a store or retail outlet. Titled ‘System and methods for receiving infrared data with camera designed to detect images based on visible light’, the patent was first filed in September 2014. 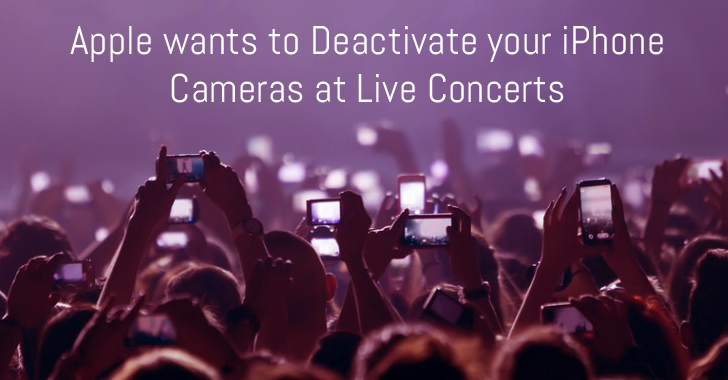 Indeed, it is pretty common to be asked or requested to turn off all electronic devices while attending any concert or show. But, majority of audience ignore the request and snap photographs and record video throughout the show. Many musicians and comedians get upset about such practices. With this technology, the company wants to help singers, actors and performers prevent illegal photos or streams from being uploaded online. Also, it would be helpful for customs officials to block anyone taking photos at a port of entry or a border. But what if people with more nefarious intentions used this technology? The technology can be used by police to limit smartphone filming of acts of brutality or protests, or it could even help a government shut off filming in certain locations. Moreover, it’s not even hard to imagine a government like North Korea or China using the technology to blackout social media coverage of the protests. Anyway, you do not need to worry too much about seeing your iPhone camera disable at certain events. Because technology companies like Apple and Google files for patents all the time, but only a few of its ideas are actually commercialized.